Late last year, we received news that the Raconteurs were at work on a new full-length album, which is expected to see release in 2019. After sharing two new songs last December, the band have now given fans a taste of a third while also breaking down some of Jack White's studio wizardry. 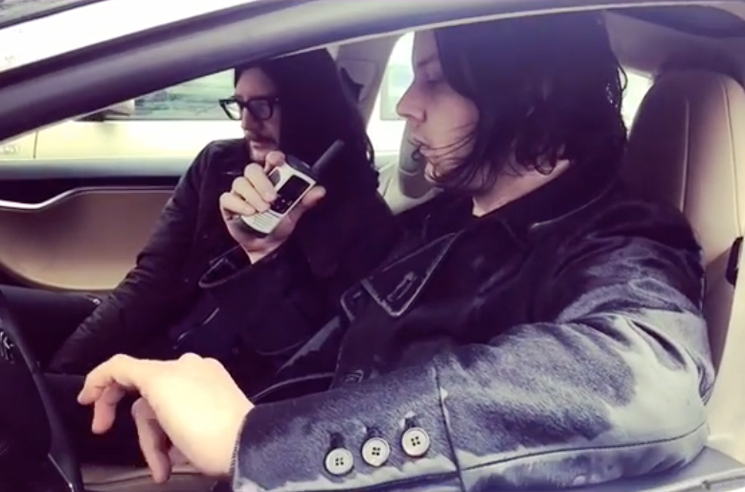 On Instagram, the band revealed they are mixing their new record alongside Vance Powell at Nashville's Sputnik Sound studio, posting video of White demonstrating a mixing technique involving an FM transmitter and a walkie talkie. The clip shows the band broadcasting a new tune titled "Shine the Light on Me" on an unused FM frequency from inside the studio. From there, they hit the parking lot and preview the final mix using the sound system in White's Tesla Model S. The band then use a walkie talkie to give notes on the mix to Powell, who is still behind the boards in the studio. As the band explain in the caption, "This way the artist can mix in real time, and hear exactly what the song sounds like on the radio as well...This speeds up the process of mixing greatly and reduces the amount of remixes that occur after artists feel they've 'got it' in the studio, only to listen in the car on the ride home realizing that the kick drum is too loud!" You can watch the clips and hear a snippet of "Shine the Light on Me" below. The Raconteurs' new album will follow their 2008 LP Consolers of the Lonely.